Hello! I hope you have had a good week and for those of you on school holidays -I hope you can enjoy reading this with a well-earned drink / cuppa at the end of the day! Today is another blog for Baukjen and I wanted to focus on capsule pieces again; but this time, ones with a “twist” – something that makes the item feel a little more interesting and creative. 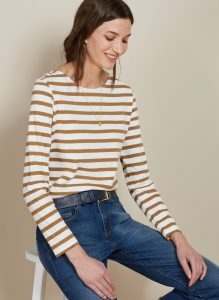 What I love above all else about Baukjen is the design team’s ability to create really simple, yet beautiful, classic pieces; the “cornerstones” of your wardrobe that we need in order to make it all work. They are also able to design classic pieces but with a twist; details that make you look again and offer that little bit more. Put these pieces alongside fashion items that come and go, add pizazz and flashes of fun and you get the right mix. I have an analogy on this that I hope will explain what I mean…! I often describe a collection of clothes in a wardrobe as similar to a group of friends. In all groups you will have the extroverts- the ones who make every party fun, who crack jokes, recount stories and bring energy to any gathering. They will be the ones who are spontaneous and suggest on-the-spur-of-the-moment camping trips or a bottle of prosecco at an 11am play date (!) or challenge everyone to a game of limbo at a BBQ. These people are brilliant, but you need the “planners” and the “doers” of the group to make these ideas come to fruition. These are the people who will remember to pack the tin opener for the camping trip, the ones who say yes let’s drink the prosecco- but possibly once the kids are in bed or the ones who make everyone warm up before the limboing starts to prevent injury!! All groups of friends need these different characters and personalities to make things flow and work. One without the other can either be a little too chaotic or a little too staid. A wardrobe is the same; too many classic pieces- you feel dull. Too many “jazz hands” purchases from mad dashes into Zara means you have a wardrobe full of one hit wonders and it is difficult to get the wear out of what you have as there is no cohesion. The key is to mix them together to get the perfect combination of a wardrobe that has pieces you can wear season after season, yet you can easily inject life, creativity and joy into them with more fashion- led, colourful, texture-driven purchases. So I have picked pieces from the collection that will last the course, won’t date, will pull your wardrobe together- yet they all have something about them that takes them out of “straight classic” into “classic with a twist”; think of them as the sensible friend who is always ready with a wink and smile! They are all able to be worn on the days when you feel paired back and simple…but they can all be dressed up and styled with a new purchase – therefore making them the very best pieces to have hanging in your wardrobe! The ability for this dress to be worn off the shoulder and for it to have an asymmetric hemline just adds two elements of joy to a classic navy dress! Take it back onto the shoulder and wear with some bright court shoes for work and it conforms to the corporate environment. Take it off the shoulder, add some strappy shoes, statement earrings and a biker jacket and you are ready for something more “off duty”. Careful if you are on the petite side with this hem length- you would need to wear a good size heel to prevent your legs looking shorter. I am a sucker for pin tucks on the shoulders; it is so flattering for those of us not blessed with much shape or definition to our shoulders. This small yet such helpful detail, as well as the fact it is cut into the waist makes this simple white top deliver so much more. It is worth spending that little bit more on something as simple as a white top as due to its nature of being a classic item. Because over time you will wear it a lot-that is where you need the quality that this price point will deliver on. If you feel your legs don’t suit skinny leathers, these ones may well work better for you. Slightly cropped and in a more relaxed cut, they won’t cling and they are a great alternative to jeans. One of my most asked questions is “what can I wear if I don’t want to wear jeans” and I always recommend leather trousers as being a great staple item; but all too often then come in a skinny style and I know many of you don’t feel that comfortable with tight, clinging styles so these are a perfect alternative. Wear with a silk tee-shirt and jacket for smarter occasions or dress them down with trainers and a lightweight jumper, it is always worth investing as much as you can afford in leather as they really do offer many styling options season after season. I LOVE these jeans (they just aren’t quite long enough for me) and the relaxed cut in white is so much kinder then a tighter style. I know white jeans cause many of you so much angst as all too often they can be slightly see-through, cling and hug areas that don’t need that type of attention(!) and wrinkle and gather so that you end up feeling your legs look like sausages. This wide, cropped style is fabulous as it negates all these challenges. My advise would be to keep your top half neat and fitted and if you are on the petite side (5ft 5 and below) I would be careful as this style could make you/your legs look a lot shorter. However, if you really love them- wear with light coloured, open shoes (similar to the ones in the picture) so that you don’t cause any type of “full stop” between trouser and shoes. The perfect alternative if the classic black and white or blue and white Bretons don’t work so well for your colouring – perhaps you are softer or warmer in your colouring so those version are just too harsh and contrasting for you? I have one of the Baukjen Bretons and the quality is amazing; somewhere between a tshirt and a lightweight jumper, the cotton is a great weight and has real substance therefore meaning it hangs well and doesn’t loose its shape the moment you move or wash it. A great skirt for those of you with a balanced, curved shape. However- the reason I love this one is that it has the added detail of the buttons and the asymmetric waistline; a simple detail but just adds more interest. If you need to add a bit more “oomph” to your hips to balance out your shoulders- this skirt will really help you to do that. I hope you like my picks as well as the advice and the background theory that goes with it. If you want to buy anything from the range I have a discount code “KATE20” which will give you 20% off full priced items – please do you pass it on to anyone who you think would appreciate it! A few weeks ago I filmed myself doing a try-on session with Baukjen clothes and posted these on my Instagram page. However, for those of you who don’t use Instagram I thought it might be helpful to give you a link so you can watch the video yourself and hopefully glean more ideas from it. If you have any questions or comments on this blog as well as feedback for the team at Baukjen – please do let me know and I can always pass it on to them.